[Oh my goodness, so many words! 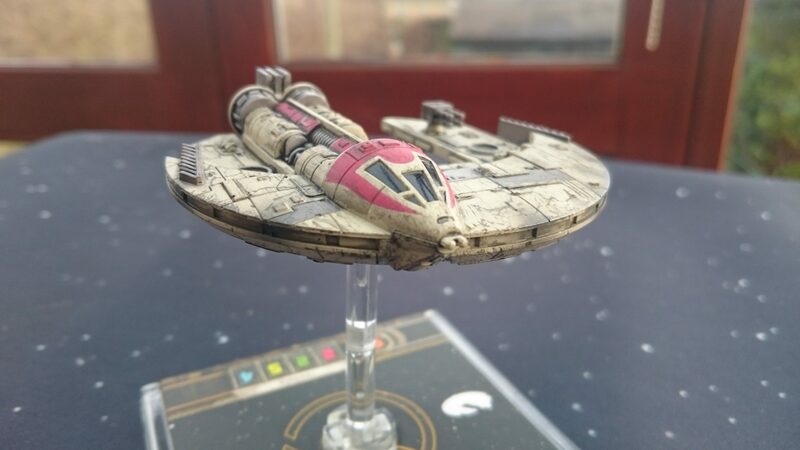 Following on from writer Chris Thursten’s awesome article about his first X-Wing tournament, he’s back with seven separate, hilarious reviews of X-Wing’s newest ships. Chris: As of March, the latest round of expansions for Fantasy Flight’s enormously popular spaceship miniatures game, X-Wing, is finally and fully here. The first – er – wave of Wave 8 arrived in December, so a few of these ships and cards have had longer to bed in than others. Even so, it’s time to round the lot of them up and force them to answer hard questions, like: WHAT DO YOU BRING TO THE GAME? WHY ARE YOU NICE? WHY DO I FEEL COMPELLED TO OWN YOU? And: IS IT EVEN POSSIBLE FOR THE SAME WAVE TO ARRIVE TWICE? WOULD THAT NOT MAKE IT TWO SEPARATE WAVES, LIKE, IN BOTH A MARITIME AND A PHILOSOPHICAL SENSE? The answer to that last one is evidently ‘yes’, by the way. Haha! Eat it, Heraclitus! Imagine if you will that it is December 2015 AD. It is almost Christmas. It is, more importantly, almost time for the first new Star Wars film since 1983. Can you imagine! One of the world’s enduring cinematic legacies, entirely absent from the screen in any meaningful sense for 32 years! That’s the amount of time it takes for a human being to be born, grow, foster dreams, foster more realistic dreams, and give up! And what a film. I saw it four times. I took my mum to see it on Boxing Day. Hearing her whisper “oh, wow!” at that shot of Resistance T-70 X-Wings low over the water, I felt more sure than ever that me being me is her fault. A few weeks into January I was struck by the beauty of that sequence when walking to work and I had to stop and take a minute because I was getting a little emotional and oh god I wish this was a joke. I would like to talk about the Resistance T-70 X-Wing now. Specifically: the first part of Wave 8, released to coincide with The Force Awakens. This is the standalone version of the same ship that came in the new Force Awakens Core Set, released in September. 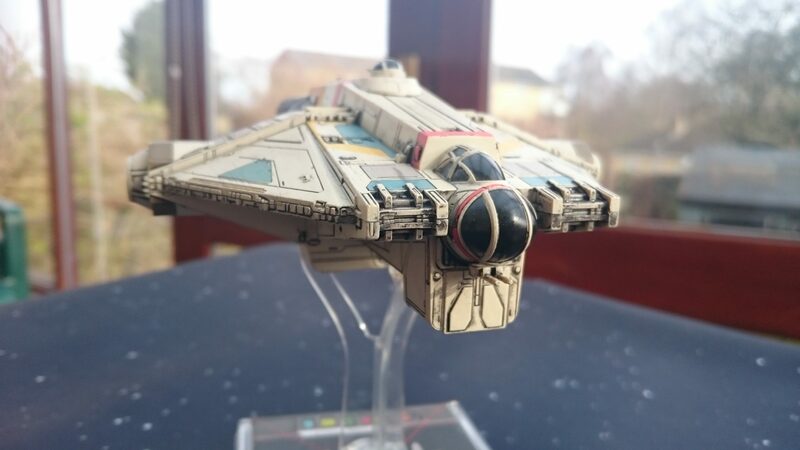 It’s a gorgeous miniature, a bigger and sexier version of the original trilogy X-Wing with chunky semicircular turbine engines that don’t make sense in the exact way that rotoscoped laser-blasts coming out of World War II handguns don’t make sense. In short: it’s very Star Wars. Even so, the Force Awakens Core Set is where you’re likely to get your first one of these. 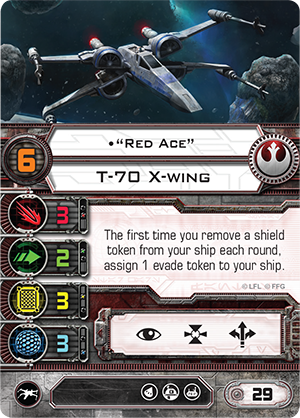 In addition to the other benefits of that box – the updated rules and damage deck, primarily – the Core Set is also where you find Poe Dameron. Poe is the single best use of a T-70 and arguably the best Rebel ace pilot hands down. The standalone T-70, therefore, fills in the gaps around Poe. Of the new pilots, Ello Asty is designed to take advantage of the new X-Wing’s unique Tallon Roll manoeuvre, which allows you to flip 90 degrees at the end of a hard turn. Ello can do this without getting stressed, allowing him to flip and boost into some unlikely positions. This is a decidedly more badass interpretation of the character than the one in the film, whose role is to be a Beastie Boys reference for a bit before claiming the Biggs Darklighter Memorial Award For Exploding and Tallon Rolling into space-carp heaven. Red Ace, who gains an evade token every time she loses a shield token, sees a little more play. There’s a natural combo between her ability, Comm Relay (which allows you to bank an evade token between turns) and R2-D2 (who allows you to regenerate your shield tokens). Bank the evade with Comm Relay, regenerate the shield with R2, lose the shield, bank the evade, and so on. The Rebels didn’t necessarily need another ace that specialises in pootling slowly around the board like an unkillable Sunday driver, but they got one. Of the new upgrades, Targeting Astromech brings a bit of much-needed efficiency to X-Wings of both sorts, as well as Y-Wings. It allows you to gain a target lock after pulling off a red (stress-incurring) manoeuvre. ‘Cool Hand’ is what Luke gets at the end of The Empire Strikes Back. Haha! A little joke. It’s actually an Elite Pilot Talent that you discard to gain a focus or evade token when you receive a stress. It doesn’t see much use because, aside from Crack Shot, one-shot Elite Pilot Talents rarely do. Even so, Cool Hand establishes a precedent that extends throughout Wave 8: manipulating stress. Stress is X-Wing’s premier control mechanic, and mitigating, removing and dealing it to your opponent is a big part of winning the game. Lists that capitalised on stress were a big part of the pre-Wave 8 metagame – one of them won last year’s world championship. Cards like Cool Hand demonstrate some of the ways that Fantasy Flight are adding nuance to the system. The utilitarian heart of the T-70 expansion is Integrated Astromech. This is a free modification that allows you to sacrifice your astromech droid to discard a damage card that your X-Wing (of either sort) has been dealt. This brings a much-needed survivability boost to the game’s oldest ship, which has suffered as the average lethality of each attack has increased and left it behind. It hasn’t been quite enough to get classic X-Wings back into the competitive metagame – there’s still work to be done, there – but this is definitely the first part of the X-Wing ‘fix’, and it’s plenty effective in casual play. For that reason, my biggest criticism of the T-70 expansion is that it only includes one copy of Integrated Astromech. In other cases – Autothrusters and Twin Ion Engine Mk. II spring to mind – cards like this have come in pairs. As it is, you’ll need to buy one T-70 for every T-65 you want to field with this upgrade, which makes it much less likely that the fix will bed in. Anecdotally, I’ve loaned more Integrated Astromechs to people at events than any card save the equally-expensive-to-stockpile Crack Shot. The standalone TIE/fo Fighter mirrors its Resistance counterpart in that it’s also a ship from the Force Awakens core set, but it’s a better-balanced offering on the whole. The First Order TIE is essentially a TIE Fighter with a beach body. It’s put on some flattering muscle in the right places, with thicker pylons and, to my eyes, stockier panels. Phwoar. This manifests in the game as a shield, which traditional TIEs lack, a targeting computer, and a more robust movement dial which includes the Segnor’s Loop: a banking turn followed by a 180-degree flip. It costs more to field than its predecessor, which makes it less suitable for ‘swarm’ play: but that’s the point. 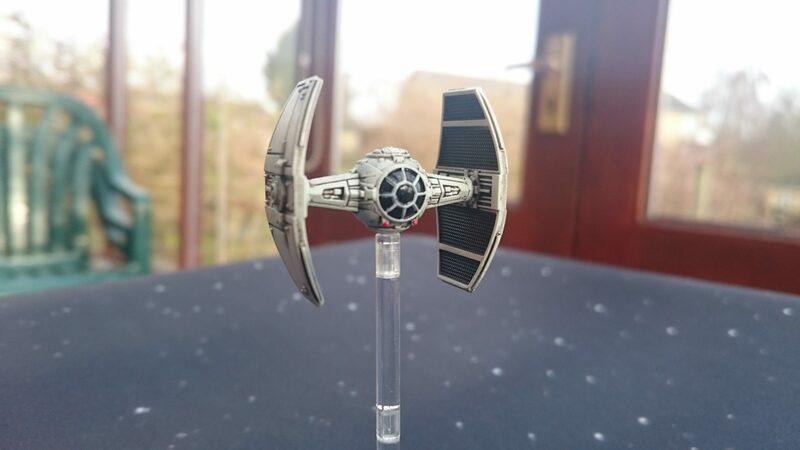 This is the TIE Fighter as a brawler, a ship that’s tough to shake at knife-fight range that undercuts the cost of the aces your opponent will need to bring in to deal with it. This is reflected in the new pilots in the standalone version, which are both excellent. Zeta Leader can receive a stress token when attacking to bolster their damage, suggesting that every other TIE pilot just isn’t trying hard enough. 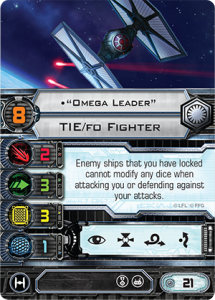 Omega Leader, meanwhile, is one of the Empire’s best low-cost aces. Any ship she target locks can’t modify their dice results when attacking or defending, turning a situational offensive action into a versatile control option. Omega Leader looks down at your endlessly-rerolling Han Solos and your focus-flipping Poe Damerons and whispers: nah. This pack also includes Comm Relay, a tech upgrade that allows either TIE/fos or T-70 X-Wings to ‘bank’ an evade token from round to round. 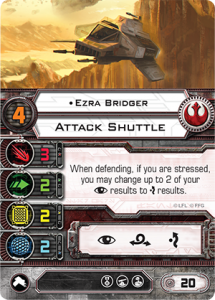 This is, in essence, the Empire’s answer to Rebel shield regeneration: rather than mitigate damage after the fact, they mitigate it beforehand by loading up an evade token before shots are fired. Red Ace can use it for both, of course. Then there’s Juke, an Elite Pilot Talent that allows you to make use of an evade token while attacking: as long as you’ve got one, you can turn an opponent’s natural evade result to a focus result. It has natural synergy with both Comm Relay and Omega Leader. The strength of this expansion is that it includes everything you need to optimally field the ship it introduces. You might want to slap a Stealth Device on Omega Leader, and that’d require a further purchase, but you don’t need to. At 26 points, Omega Leader with Juke and Comm Relay is a steal. My first (and only, so far) tournament victory came thanks to three TIE/fos and a TIE Interceptor. I’ll always be fond of these ships. 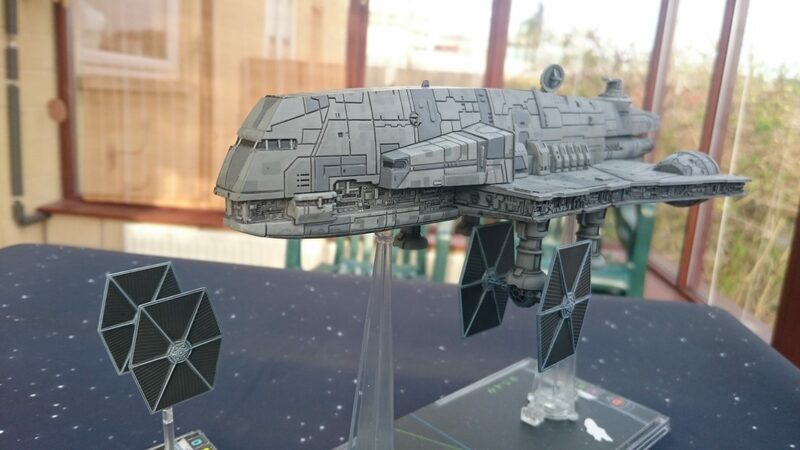 The last of December’s releases was the Imperial Assault Carrier, aka the Gozanti, aka the novelty TIE Fighter party bus. 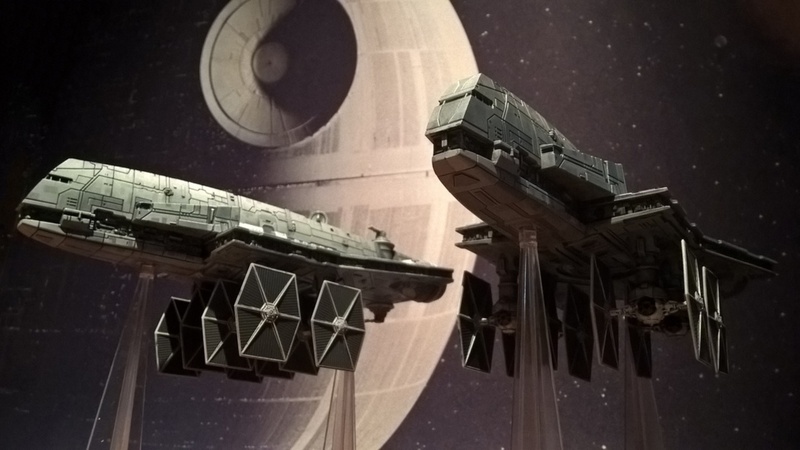 This is an Epic ship, meaning that it’s intended to be fielded according to the special ruleset used by other Epic ships – the Imperial Raider, the Tantive IV, and the Rebel Transport. You can’t use it in regular play outside of the branching campaign missions included with this expansion. As with any Epic ship, you need to weigh the pricetag against a couple of factors: how often do you play Epic? How much do you like the model? How much do you need these cards? This was the first of X-Wing’s crossovers with the (excellent) Star Wars: Rebels cartoon. The Gozanti is a freighter repurposed by the Empire to carry TIE Fighters into battle, and this is reflected in both the ship’s unique upgrade, Docking Clamps, and – brilliantly – in the miniature itself. Beneath the ship are four detachable clamps that accept a regular TIE miniature. They need to be fitted upside-down, but you can’t tell if you squint. That’s a TIE Fighter joke. This is one of those miniatures that happily paddles into the shallow waters of toy-hood, and is better for it. 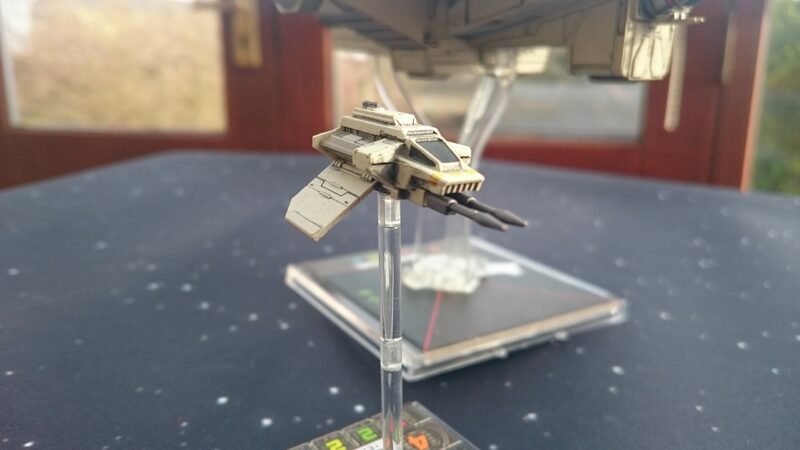 You can also have it carry your TIE Advanceds, your TIE/fos, your Interceptors – although not your Bombers, which are legal to dock according to the game rules but don’t actually fit the model. TIE deployment is, despite being the ship’s reason to be, of situational use. I don’t think it’s particularly useful if what you want is a swarm: you may as well deploy them in formation at the start of the game. What it does allow you to do, however, is spit TIEs into places that your opponent won’t have been able to account for. When enemy fighters converge on the cruiser – which they will, it’s a flimsy thing – deployment gives you the option to set up a squadron’s worth of flanking manoeuvres all at once. Even so, there’s a (good) argument to be made that this isn’t as desirable as simply blowing everything up, all of the time. The Assault Carrier’s other contribution to Epic, to that end, is Ordnance Tubes. This is a modification that allows you to fit missiles and torpedoes on huge ships in place of regular hardpoint turrets, and makes them free to fire – no ammunition to consider. The Imperial Raider in particular is well-suited to a refit as a close-range missile barge. The best (and I mean the best) thing I’ve done in X-Wing since the first part of Wave 8 came out is hit a gaggle of Twin Laser Turret Y-Wings with movement-disabling Ion Torpedoes before ramming all three of them at once. I lost the game, but it was worth it. 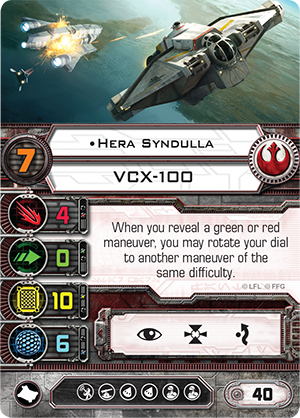 The Assault Carrier’s contribution to standard play comes in the form of two TIE Fighters with a blue-grey paintjob and a raft of new unique pilots. Of these, two really stand out. Much TIE swarm theory-craft has centred around Youngster, who allows all TIEs (or TIE/fos) in an area to share the action on Youngster’s Elite Pilot Talent. Not every EPT comes with an action, mind: the top candidates are the critical hit-incurring Marksmanship, the attack-boosting Expose, and Rage, also new to Wave 8. A horde of very very angry, very very stressed TIE Fighters introduces a new dynamic to swarm play: they’re deadly on the first pass, but they’re so cross about everything that it’ll take them an age to turn around. 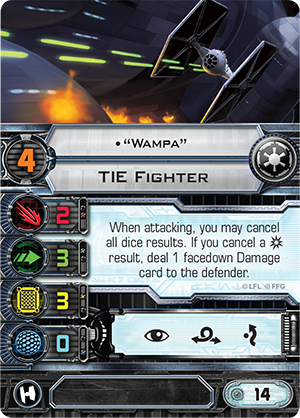 Wampa is the other notable pilot, neither a swarm-booster nor a brawler but – strangely, perhaps – a sniper. Wampa’s ability allows you to cancel a critical hit result on your attack roll to deal a single point of damage directly to the enemy’s hull, ignoring shields and defensive rolls. If you’re able to reliably get the crit result you need (Youngster with Marksmanship and a shuttle with Palpatine both do this) then this cheap little filler ship becomes a real threat to evasive aces. The Gozanti TIEs have been effective at diversifying the roles that the Empire’s cheapest ships can play. The traditional swarm archetypes still rule in my local scene, but it’s possible to strategise around the specific strengths of certain pilots – particularly Wampa – in a way that you couldn’t before. ‘Not just filler’ is the theme, here. Then, three months passed. Fantasy Flight’s cargo ship continued to perform leisurely doughnuts in the middle of the Pacific. From kitchen tables to tournament boards, the first part of the wave settled into familiarity. Most of it was already pretty familiar, after all: revamps of ships that were already out in one form or another. I waited. And waited. Then! March. I remember the moment that the rest of Wave 8 arrived like it was two and a half weeks ago, because it was. This is where we get into the really meaty new stuff. 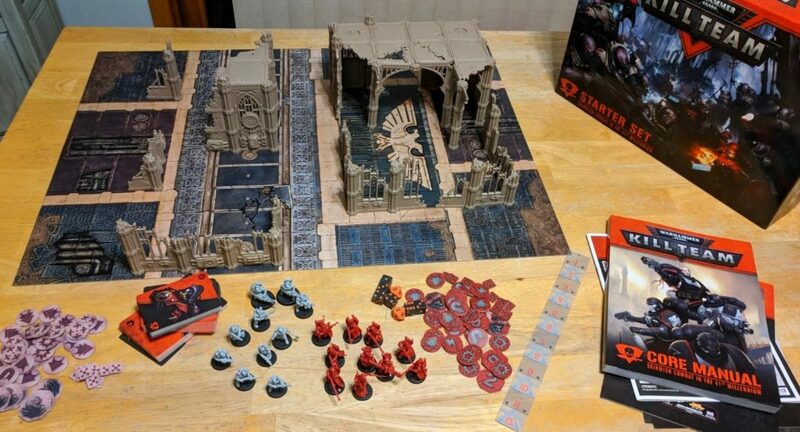 I want to start with the Ghost, because it’s the biggest and most complicated of the new sets and probably my favourite. This is the ship from Rebels: the one the rebels fly around in, rebelling. The Ghost itself is a large-base ship – by far the largest in the game, in fact. It’s a three-storey building with thrusters, so big that it needs a custom stand. It’s actually comparable in size to the Gozanti, and that’s a cruiser designed for Epic play. I love the look of the miniature, but among my friends opinions are divided. Where the Millenium Falcon is technically a cargo ship refitted for action, the Ghost really looks like it is. This is a battle lorry, a tugboat with a World War II bomber’s bubble cockpit. Its pastel paintjob doesn’t scream ‘rebel covert ops’, but that’s sort of the point. This is the heaviest Rebel ship across the board. Unlike the nimble Falcon, it’s built like a brick Sith house – the ship it most resembles is the Empire’s lumbering Decimator. Both have sixteen effective hitpoints, the highest in the game, but zero agility – meaning that they don’t get to roll evade dice when they’re fired upon. A Ghost that draws sustained fire is a Ghost that blows up. As such, the ship packs a tonne of tricks to stop that from happening. Starting with an entirely separate ship. The other ship in the box is the Attack Shuttle, which amounts to a new Rebel heavy fighter in its own right. The two ships can be used separately, but they’re designed – as in the cartoon – to be used in synergy with one another. Through the use of the Ghost and Phantom titles, the Attack Shuttle can begin the game docked in the Ghost and, as long as it remains so, it grants its host bonus abilities – including a rear firing arc and an extra round of turret fire. Then, just like the Gozanti, the Shuttle can be deployed into battle at the Ghost pilot’s discretion. Knowing when to give up the benefits of being docked for the advantages of having an extra fighter in play is the first of many new strategic considerations. There are lots more. The Ghost and Phantom can be configured in a huge amount of different ways based on who is flying them, who’s on board and what type of weapons they bring to bear. You can gear the Ghost for long-range fire support, close-range brawling, support or control – and the best thing about this expansion is that you don’t necessarily need a massive collection of upgrade cards to do so. Every member of the cartoon’s cast makes an appearance as a crew card, pilot or both, and each of them brings a different set of skills to the ship and the game as a whole. They’re wonderfully designed, nailing that X-Wing thing of expressing personality through game systems. Ezra, in both pilot and crew form, is all about turning stress into something positive – he flirts with disaster but pulls through in the end. Kanan, his foil, manages stress and mitigates enemy damage – he calms everything down. Sabine, meanwhile, is always holding a bomb. Hera Syndulla has become one of my favourite pilots in the game. Her ability allows you to swap a green manoeuvre for any other green manoeuvre, or a red for any other red, when you reveal your movement dial. Fantasy Flight have experimented with ‘change your mind’-type skills before – Imperial Boba Fett being one example – but Hera and the Ghost is the first time the idea has really taken off for me. This is thanks to the Ghost’s dial. Unlike the rather predictable Decimator – designed to trundle into battle, trundle through the battle, and trundle back around to continue the battle – the Ghost has the power to move unpredictably. Its red manoeuvres include sudden hard turns and, brilliantly, a 5-speed K-turn. This is the longest 180-degree flip in the game, and the sight of this massive ship suddenly shooting across the board and spinning around is both absurd and entirely appropriate to the TV show. It also frames the ship’s lack of evade dice in a different light. The Empire likes to soak up damage as they roll in, but that’s not how the Rebellion does. I love Hera because she allows you to confound your opponent – to feint, like you’re going to joust their TIE swarm head-on, but then change your manoeuvre to a hard turn that takes you through their formation and out the other side, rear guns facing right where you want them. If there’s a downside, here, it’s that a Ghost that gets caught out dies deceptively quickly. For the hero ship of a cartoon for children, it’s actually pretty tough to fly well. Doing so means digging into the synergy between crew cards, pilots and other upgrades and being able to hold all of their various abilities in your head at once. This is fine for experienced players but a challenge for newcomers. I have a friend who got into X-Wing primarily because he likes the Ghost miniature so much: teaching him to fly it felt like teaching him how every single system in the game worked all at once. Then he flew the Ghost straight at my TIE swarm and it exploded in a single round of shooting. As the Ghost fell he deployed Ezra in the already-damaged Phantom. I formed a box with my TIE Fighters and gunned down Rebels’ fourteen-year-old protagonist firing squad-style. It felt a little grim, to be honest with you. Not that the show is without darkness. That swarm was led by the Inquisitor’s TIE, the most significant addition to the Imperial roster in the new wave. This is the ship that you may also hear referred to as the TIE Advanced Prototype, or TAP – it’s a baby version of the TIE that Darth Vader flies, basically. 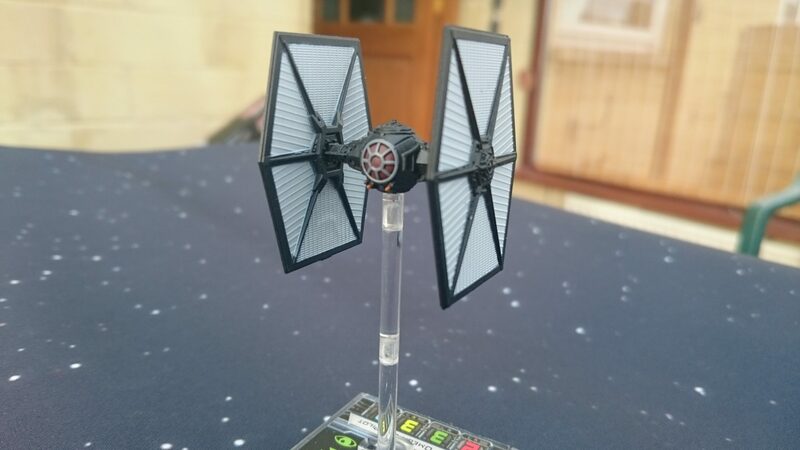 Despite being relatively straightforward – this is an off-white TIE Fighter with curved panels and a chunky posterior – the Advanced Prototype model demonstrates how much better FFG’s pre-painting has become. I’ve ended up in possession of four of the things, and they’re gorgeous: sharply-defined detailing between the panels, glossy little cockpits. They look great on their own and in formation. Which is handy, because they work either way. The Inquisitor’s TIE fills a gap in the Imperial arsenal between the TIE/fo and the traditional Interceptor. They’ve got the maneuverability of the latter but the utility (and weaker firepower) of the former. The Advanced Prototype’s party trick is its ability to turn on a dime: this is a ship that is incredibly hard to shake once it gets close to thing it wants to kill. The downside is that it takes a while to kill anything on its own. Regular TIEs mitigate their individual lack of damage by grouping up, but TAPs have other options. The Inquisitor himself is the most obvious example: his special ability is that his primary weapon attacks are always considered to be taking place at range 1. 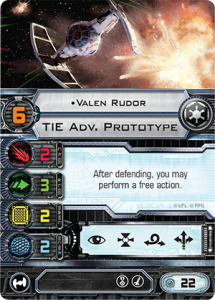 Valen Rudor is a lot of fun, too: he gets to take an action every time he gets shot at, making him a rare example of a pilot that wants to joust aces that’ll fire before him. They fire at range 2, you defend, perform a boost action, and then get to perform your own attack point-blank. The fun thing about missiles is that you can’t ignore them, particularly now that their damage is less dependant on a good dice roll. A cheap ship with a rocket down its trousers is a potential problem for as long as it’s alive, so their presence forces a few uncomfortable decisions: do you let it do what it wants and focus your fire on an enemy ace instead? Or do you attack it and risk granting a higher-value ship free use of the board? On the other hand, you don’t want to lose your missile boats before they’ve spent their ammo. This twist to competitive play introduces new drama to the game as a whole, to everybody’s benefit. Nowhere is the rise of ordnance more keenly felt than in the Punishing One expansion, the first of the wave’s two new Scum ships. The Punishing One is the personal vessel of Dengar, one of the bounty hunters in that one scene in The Empire Strikes Back where Darth Vader lines up lots of bounty hunters on the bridge of the Executor because email BCC lists don’t exist in Star Wars. 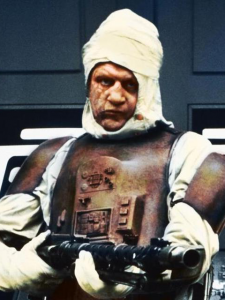 Dengar, if you are still unsure, is the one that looks a bit like a divorcee that has had to tie his own turban ever since his wife left and took the kids. By contrast to the Ghost, the Punishing One is one of the smaller large ships in the game: petite, even. Opinions vary on what exactly it resembles. I go with ‘toilet seat’, personally – in particular, it reminds me of this Robot Chicken sketch. Others see a croissant. The miniature is painted to look grubby, and I’ve noticed some variance in this – some Punishing Ones look relatively clean, others look like they’ve been through the ringer. Mine, pictured above, is on the grubbier end. 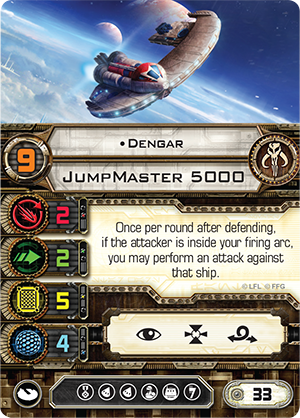 The Punishing One name is earned by Dengar’s pilot ability, which allows him to fire a retaliatory strike against anybody who shoots him head on. Other notable new upgrades include Attani Mindlink, which allows two Scum pilots to share one another’s focus, evade and stress tokens, and a crew version of Boba Fett. Boba Fett is fun. 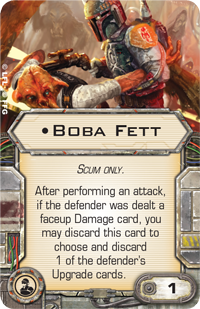 When you deal a critical hit to an enemy ship, you can discard Boba Fett to choose one of your opponent’s upgrades and remove it. In some cases, the scenario that this suggests is dramatic: Boba Fett bursting onto Palpatine’s Lambda Shuttle and assassinating the Emperor himself! In others, it is silly: Boba Fett sneaking onto the Millennium Falcon and quietly dismantling their engine upgrade. Boba Fett slipping into Soontir Fel’s TIE Interceptor and preventing him from using his Push The Limit talent, presumably by making him feel bad about himself or something. The possibilities are endless and weird. None of these things explain why the Punishing One has set the X-Wing competitive community on fire, however – nor why you might struggle to find one in stock at the moment. For that we’ve got to return to ordnance, specifically torpedoes, and the JumpMaster 5000’s absurdly cheap generic pilot, Contracted Scout. Long story short: thanks to Guidance Chips and Contracted Scout, it’s possible to field a squadron of three JumpMasters with enormous jousting potential. You point your toilet seats/battle croissants at whatever you’d like to kill, and chances are you will. The community saw this combo coming a mile off and as such it’s the current flavour of the month. This needn’t concern you if you just play for fun, but beware the friend who shows up around your house one day with a Punishing One or three. You will hear their approach: first horns, then Eurodisco, growing louder. I have been writing about Wave 8 for an extremely long time now and thank god it is almost time to stop. Finally to the Mist Hunter, Wave 8’s other Scum ship. 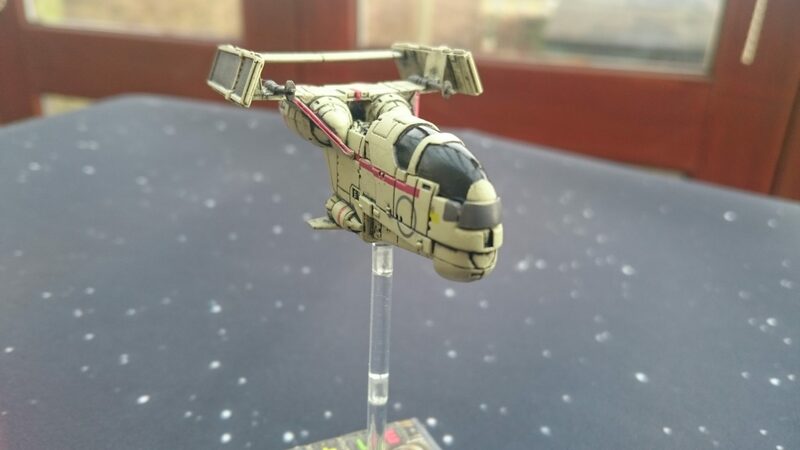 This is a heavy fighter belonging to 4-LOM and Zuckuss – and with them represented, X-Wing has a ship for Darth Vader’s entire bounty-huntin’ boyband ensemble. Miniature-wise, it has the bearing of one of those chunky Russian attack helicopters. In-game, the lazy way to describe it would be as a Scum B-Wing. FINE. Fine. It’s a heavy fighter with a manoeuvre dial hemmed in by red manoeuvres, with a beefy primary weapon and lots of upgrade slots but minimal evasive options. It doesn’t want to draw focus, but it’s highly effective for as long as it survives. Unlike a B-Wing: 4-LOM and Zuckuss themselves. Bounty hunting’s premier bug-themed power couple are present as both crew and pilots, and synergise with one another either way. Zuckuss can roll extra dice on attacks, but gives opponents extra evade dice as a consequence – gambling on the fact that, over time, X-Wing favours offensive rolls over defence. 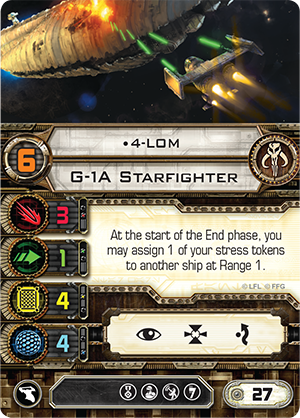 4-LOMs power allows him to pass one of his stress tokens to another ship at close range at the end of the turn. This is a lot of fun: you can stress an enemy for no cost if you get into the right position, or you can have another of your ships take on your burden for you. Like a bad manager, 4-LOM vents his stress at a subordinate and forces them to deal with it. There are a bunch of interesting upgrades in the Mist Hunter expansion beyond the ship. This is the first place you’ll find the long-awaited Tractor Beam cannon, which allows you to reduce an opponent’s agility and potentially slam them into obstacles. An additional but very specific benefit of this card is that I predominantly play X-Wing in Somerset, where the phrase ‘Tractor Beam’ is a reliable source of entertainment. Scum receive their own Cloaking Device in the form of an Illicit upgrade. This is the first time the Cloak action has been made available beyond the Imperial Phantom, and it opens up a lot of options: invisible support HWK-290s, invisible Kihraxz fighters, and so on. The caveat is that a Scum bootleg Cloaking Device has a chance to fail – and break permanently – at the end of any turn in which it is used. This is a nice bit of Scum design: they’re a faction of chancers, after all. This is also where you’ll find Adaptability, the first X-Wing ‘Dual Type’ card. This is an Elite Pilot Talent with ‘+1 Pilot Skill’ on one side and ‘-1 Pilot Skill’ on the other. It’s free, merely taking up an upgrade slot, and the idea is that you choose at the start of the game whether you want to boost your pilot’s skill or lower it in order to move first. The most interesting applications of the Dual Type format are yet to come, I feel: Adaptability is novel but not earth-shattering in its own right, and unless you’re really into spaceship battle maths you’re unlikely to lose your mind over it. Taken collectively, Wave 8 brings a lot of new ideas to X-Wing. Regardless of the faction you play, you will find something to change the way you think about your squadron: whether that’s cloaking your Scum ships or docking your Rebels or strapping missiles to your TIEs. 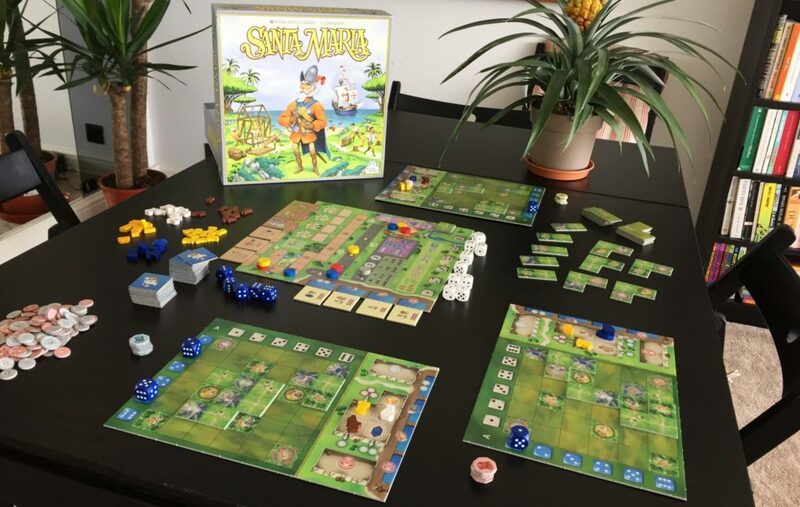 It has been successful as a refresh and it has encouraged players of an already-creative competitive game to play more creatively. 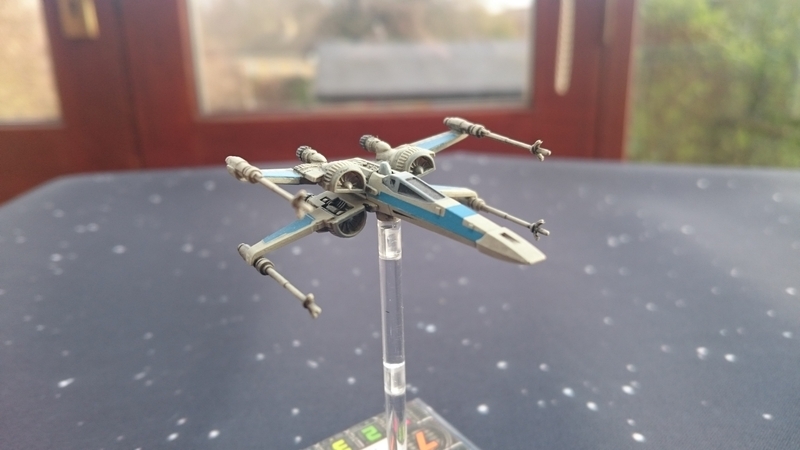 X-Wing is certainly experiencing some power creep both in terms of the strength of the ships that are fielded and in how complicated they are to kit out and fly, but this is still an accessible (and relatively cheap) miniatures game. Every part of the wave has something to offer committed players, but the March contingent in particular stand out. They’re a really varied bunch, and I feel confident saying that you could pick up any of them and end up with a ship that can win games, that feels different to anything else in its faction, and that encourages you to start digging deeper into X-Wing’s underlying systems. Fair warning: that’s how it starts. It ends with you stressing yourself out trying to figure out what colour acrylic you want for your custom movement templates. It ends with you wondering: okay, then. Where’s Wave 9?